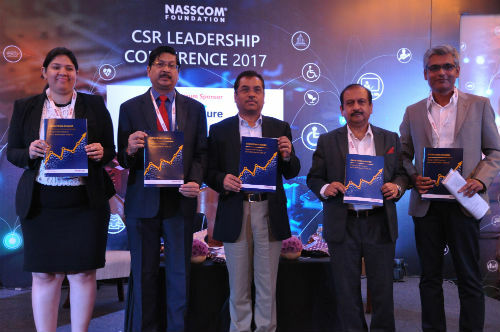 Bengaluru: NASSCOM Foundation at its flagship event, The CSR Leadership Conference (CLC), announced that the Industry had widely accepted the 2% CSR rule with a trend of more companies coming out openly to declare 100%+ utilization of their CSR money for 2016-17. This year the CLC went beyond discussing basic intervention areas, to talk about new developments, innovative tools and disruptive ways of making the ecosystem better, more impactful and efficient. In this process, the CLC will deep dive into Re-Calibrating Employability through CSR, Social Impact Investing, Leveraging Big Data for Impact, Unlocking the Value of Corporate Sustainability in the form of panel discussions, fireside chats and impact talks. · Growing number of companies spending 100% and above of the CSR funds, among both MNCs and Non-MNCs: 61. 6% of the surveyed companies reported spends of 100% or above their prescribed CSR budget. This includes 63.3% of the MNCs and 68% of the Non-MNCs. · Smaller sized companies (turnover below INR 100 Crore) proactively pushing CSR initiatives with full utilization of prescribed budget: While 57.57% of large companies, 53.3% of medium companies are spending 100% of CSR funds, an impressive 72.7% of small companies spending 100% of CSR funds. · Underspending is a rare condition: Only 5% of companies surveyed reported a spend of less than 50% of their CSR budget. o 18% on Gender equality. The event saw over 400 CEOs, CXOs, CSR Heads, HR Heads of the top most companies from across various industries with the NGO Leads, Government officials, thought leaders, Tech4Good champions, social innovators come under one roof to discuss and create collaborative and innovative ways of fulfilling the most important Social Development Goals for India. The CSR Leadership Conference also had on showcase, innovations from various social startups and NGOs like Sohum Innovation Lab, Neurosynaptic, EYE-D, Bleetech Innovations, Sankalptaru, Foundation for Ecological Securities, Headstreams, CFBT among others. Through its unique NGO impact wall and Networking spaces, the CSR Leadership Conference also provided an opportunity to 100+ participating NGOs to showcase their work to the corporates and connect at a programmatic level.